Saute pork, add red chile sauce and bring to boil, then simmer for ca. 15 minutes; season with salt and garlic to taste. 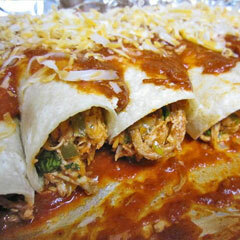 Remove from MW, top with 1 Tblsp of chopped onion, 1 Tblsp of shredded cheese and 1-2 ladles of red chile sauce with pork. Garnish plate with chopped lettuce and tomato around the rim. *You may use corn tortillas instead, one or two per serving. If you use two, follow as above and repeat process with 2nd tortilla and top with eggs after second layer. Corn tortillas have to be dipped in hot oil for a few seconds prior to use.